Description: This Pocket Rocker Collector's set includes a Pocket Rocker (miniture tape player) and 5 Pocket Rocker mini tapes. 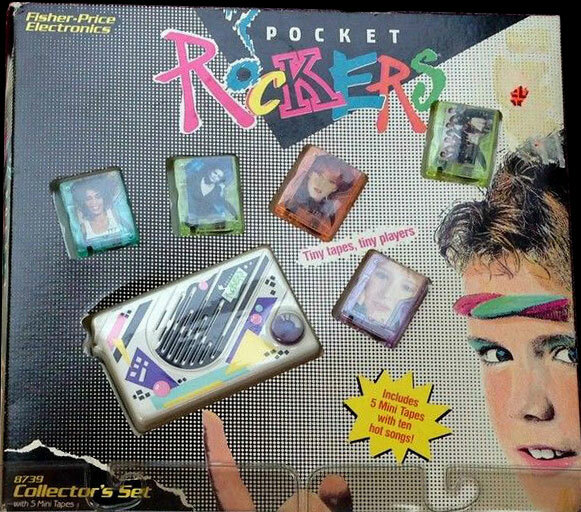 The Pocket Rocker player requires two AA-size batteries. Designed for children ages 7 years and older. FPT19195 - White Pocket Rocker Player with a black speaker area and purple volume knob on the front. The front also has large pink, blue, yellow, black and purple geometric shapes. 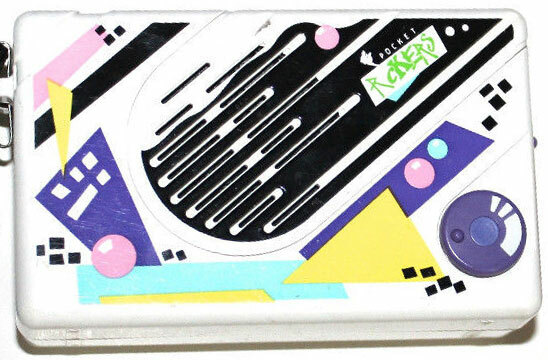 The player has a black rectangular flap on top to insert a Pocket Rockers mini tape. The top also has a small purple knob to switch tracks. The side of the player has a purple knob to eject a Pocket Rockers mini tape and has a headphone jack. The back of the player has a belt clip and a battery compartment to place 2 AA-size batteries. Measures 4" wide, 2-3/8" high, 1-1/2" deep.